Please note: the following setup is only intended for testing and not for production. cat make-full-tidb-server #!/bin/bash set -x cd /tidb wget http://download.pingcap.org/tidb-v2.1.2-linux-amd64.tar.gz tar -xzf tidb-*.tar.gz cd tidb-*-linux-amd64/ ./bin/pd-server --data-dir=pd --log-file=pd.log & sleep 5 ./bin/tikv-server --pd="127.0.0.1:2379" --data-dir=tikv -A 127.0.0.1:20165 --log-file=tikv.log & sleep 5 cd ~/go/src/github.com/pingcap/tidb make server ./bin/tidb-server --store=tikv --path="127.0.0.1:2379"
The normal installation process is described here (different methods are available). The main purpose of this test is to compare MySQL to TiDB. As with any distributed database it is hard to design an “apples to apples” comparison: we may compare a distributed workload spanning across many servers/nodes (in this case TiDB) to a single server workload (in this case MySQL). To overcome this challenge, I decided to focus on “efficiency”. If the distributed database is not efficient – i.e. it may require 10s or 100s of nodes to do the same job as the non-distributed database – it may be cost prohibitive to use such database for a small or medium size DB. The preliminary results are: TiDB is much more efficient for SELECT (OLAP workload) but much less efficient for WRITES and typical OLTP workload. To overcome these limitations it is possible to use more servers. OLTP: sysbench (as always): point-select and write-only standard workloads. This is throughput test, increasing the number of threads. Database size is 70Gb in MySQL and 30Gb in TiDB (compressed). The table has no secondary indexes (except the primary key). x1e.xlarge is an example of the opposite instance type: 4 CPU core and 122GB RAM, I’m using memory bound workload here (where both MySQL and TiDB data is cached). All other instances have enough RAM to cache the database in memory, and with more CPU TiDB can take advantages of query parallelism and provide better response time. This workload is actually gives a great advantage to MySQL/InnoDB as it retrieves a single row based on the primary key. MySQL is significantly faster here: 5x to 10x faster. Unlike the previous workload – 1 single slow query – for “point select” queries MySQL scales much better than TiDB with more CPU cores. Here we can see that TiDB is also significatly slower than MySQL (for an in-memory workload). Running TiDB as a single server is not a recommended (or documented) configuration, so some optimizations for this case may be missing. To create a production level test, we would need to compare TiDB to MySQL with the binlog enabled + some sort of synchronous/virtually synchronous or semi-sync replication (e.g. Percona XtraDB Cluster, group replication or semi-sync replication). Both of these changes are known to decrease the write-throughput of MySQL considerably. Some tuning may be done to reduce the effects of that. Some of the performance characteristics here are also derived from TiDB using RocksDB. The performance of InnoDB should be higher for an in-memory insert, with an LSM tree performing better for data sets that no longer fit in memory. 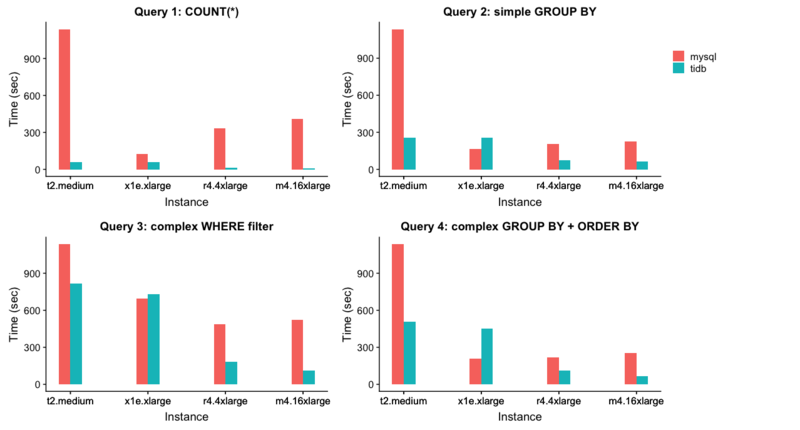 TiDB scales very well for OLAP / analytical queries (typically complex queries not able to take advantages of indexes) – this is the area where MySQL performs much worse as it does not take advantage of multiple CPU cores. At the same time, there is always a price to pay: TiDB has worse “efficiency” for fast queries (i.e. select by primary key) and writes. TiDB can scale across multiple servers (nodes). However, if we need to archive the same level of write efficiency as MySQL we will have to setup tens of nodes. In my opinion, TiDB can be a great fit for an analytical workload when you need almost full compatibility with MySQL: syntax compatibility, inserts/updates, etc. Thank you for trying out TiDB! As you note, TiDB is well suited for analytics, but the performance numbers you experienced for the write-only test are lower than expected. This is great feedback, and something we are working on improving in our upcoming 3.0 release. Thanks for sharing this study! What version of MySQL where you using? I find it a bit strange that MySQL will use more time for the simple count query on the larger machines than on x1e.xlarge. Why should the number of cores matter for single-thread executions? Do you have any explanation for that? Also, it seems the group by queries uses less time that the simple count on these larger machines. That seems strange to me. I’m interested about the results of PXC & MGR & TiDB on OLTP workload,such as sysbench oltp. I think the result is misleading. Some result is even contradict as Øystein Grøvlen pointed out. What’s more, you don’t show the query execution plan. Maybe there is much room for MySQL to optimize. TiDB is not suited for OLAP at all, they recommend TiSpark to query complex SQL instead. As for OLTP, TiDB is no sense. These benchmarks are interesting but they are kind of Apples to Oranges. That MySQL will win on any write heavy tasks is a sure thing, as both DBs are written with different designs. It will have been nice if you also included a replicated mysql cluster vs TiDB cluster in the results, to see a more real world view. Nobody in there right minds runs a single database instants ( unless you love the risk to lose data)? Another detail left out, … Databases like TiDB, CRDB are more tolerant to run on cheaper / lighter machines thanks to this build in default replication, where as your more or less forced to go with a very reliable ( aka expensive ) server, when faced with a single mysql instance. The lack of a downtime buffer is always present on a single instance mysql server.